Linux (ext2/ext3/ext4) and Mac (HFS, HFS+, HFSX). SP151 is a professional NVMe M.2 SSD and SATA duplicator. Native support NVMe and SATA protocols enables cross-signal and cross-interface duplication. It is designed specifically for small volume users and adopts high level FPGA closed platform design, which can eliminate the possibilities of virus infection completely. 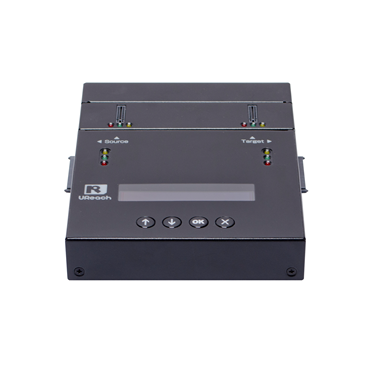 All U-Reach PCIe duplicator supports easy Plug and Copy operation mode. It completes duplication in 3 steps: power on, plug in, and press OK. It provides four copy modes: quick smart copy, all partitions copy, percentage copy and whole copy that all meet different duplication task requirements. The quick copy mode copies data and skips blank area. NTFS, Linux (Ext2/Ext3/Ext4), FAT/FAT32/exFAT and Mac (HFS, HFS+, HFSX) formats can all be supported with quick copy mode. In addition, the SP151 has modular-designed M.2 ports effectively reduce downtime and is cost-effective for long-term ownership.